(Matt York | The Associated Press) In this Monday, July 25, 2016 file photo, Chris Fleischman protests outside Maricopa County Attorney Bill Montgomery's office in Phoenix. Loreal Tsingine, a Navajo woman who was fatally shot by an Arizona police officer earlier this year, had medical scissors in her hand as she approached the lawman, body camera video released Wednesday shows. The shooting led tribal officials to urge the U.S. Justice Department to investigate the treatment of American Indians who live in towns bordering the reservation. 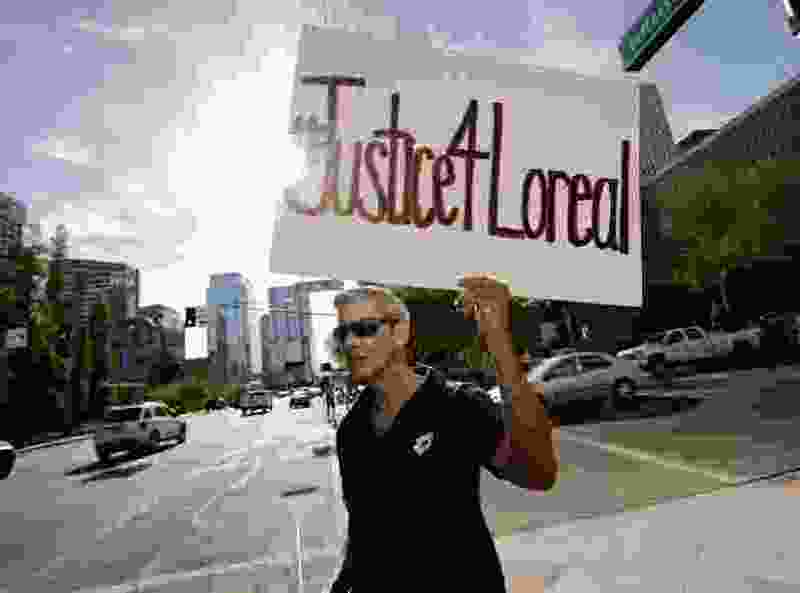 Flagstaff, Ariz. • Attorneys for the U.S. Justice Department want a federal judge to drop a lawsuit that faulted the office for not prosecuting an Arizona police officer in a Navajo woman’s death. The Navajo Nation sued the federal government and the city of Winslow in March on behalf of Loreal Tsingine’s daughter. Authorities say Tsingine posed a threat to now former Winslow police Officer Austin Shipley when he killed her in March 2016. Navajo officials say he should have used non-lethal force. The tribe alleged violations of her equal protection rights in its claim against the Justice Department. The department has said it couldn't prove beyond a reasonable doubt that Shipley willfully used excessive force. It asked a judge this week to dismiss the federal defendants, saying they’re immune from lawsuits.